At the famous Jejuri Khandoba Temple, dedicated to Malhari Martand, Somvati Amavasya is a highly auspicious date. Somvati Amavasya is the no moon day in a Hindu calendar. Somvati Amavasya dates at Jejuri Khandoba Temple in 2019 are on February 4, June 3 and October 28, 2019. The main ritual on the day is the offering of Bhandara – turmeric powder. Large amounts of Turmeric powder are thrown in and around the temple on the day. 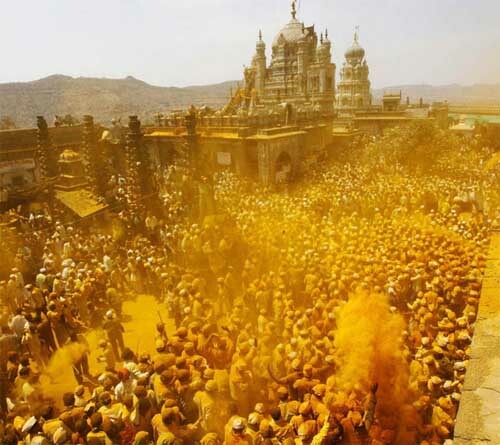 Devotees virtually bathe in yellow color. Devotees also offer various penance on the day. Khandoba is a manifestation of Shiva and is worshipped mainly in Maharashtra, Goa, parts of Karnataka and Andhra Pradesh. Khandoba is also known as Khanderao, Khanderaya, Malhari Martand and Mallu Khan.